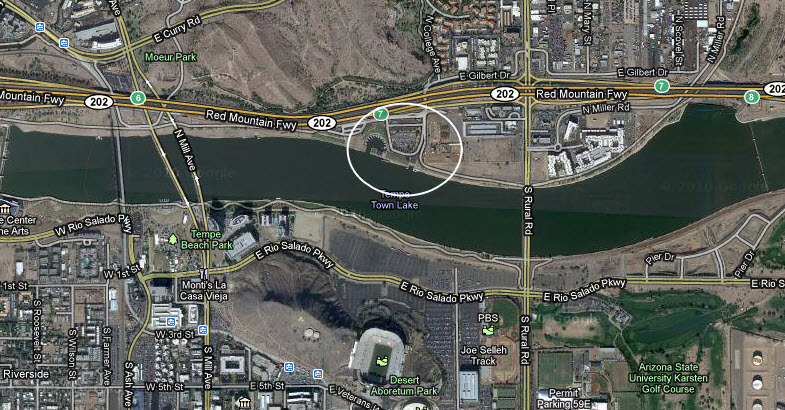 Tempe Town Lake is right smack in the noisy center of metropolitan Phoenix, a triumph of technology and political will. Highway 202 (The Red Mountain Freeway) borders the lake on the north. 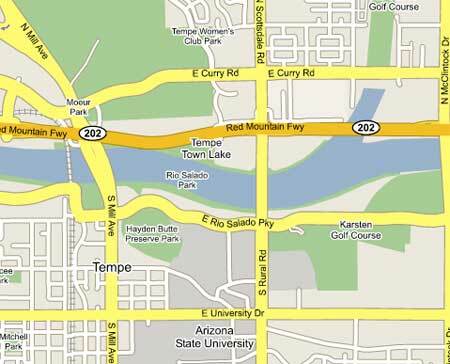 Sailboats are allowed to use the section of the lake bounded by the Mill Avenue bridge on the west and the Rural Road bridge on the east (it’s called Scottsdale Road in Scottsdale, Rural Road in Tempe). There’s no charge to enter the marina and there’s usually sufficient parking. To put a boat in the water requires a city permit, which is available at the lake office. The most recent information regarding boat permits is on the Tempe City Website Boating Page. They can also fill you in on other regulations. Here’s the entire map so you can navigate it. And below you’ll find a satellite shot from Google. We’ve circled the marina. That’s Sun Devil stadium directly south, across the lake.